Note the satellite links will be not quite right due to new satellite. 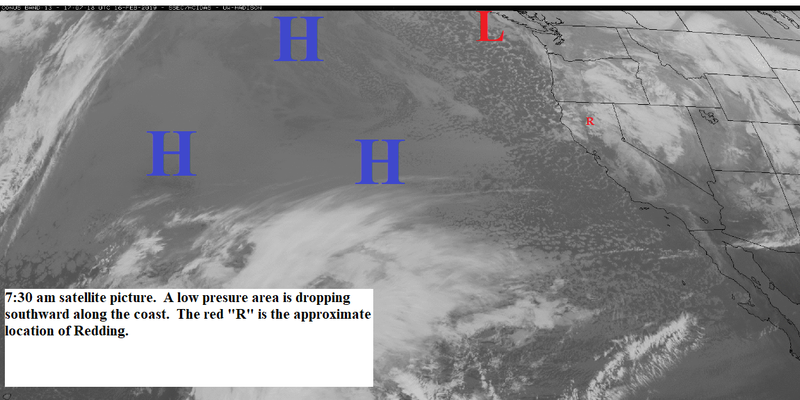 The low pressure area continues off the coast. This system has brought a lot of rain to the north state with very heavy snows in the mountains. The low will remain off the coast today and then move northeastward late tonight and Thursday. Expect more rain heavy a times today with snow levels 4500 to 5500 feet north and 5000 to 6000 feet south. Gusty south winds will continue today. Thursday there will be showers over the areas north and east of the valley with partly cloudy skies elsewhere. Snow levels will be around 4000 feet. Friday looks partly to mostly sunny. However, another low pressures trough will move through Saturday and Sunday. Look for more rain with snow levels 4000 to 5000 feet. We get another brief break Monday and then Tuesday and Wednesday another low pressure trough will bring rain to Northern California with snow levels near 5000 feet (see map below). Note the satellite links will be not quite right until the new satellite is fully operational. 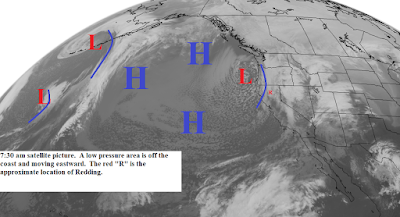 A low pressure trough is off the coast. A band of clouds...moisture...is being pulled over Northern California. This pattern will continue through Wednesday. Today through Wednesday Northern California will have periods of rain heavy at times. Snow levels today are 3000 feet north and 4500 feet south but will rise to 4500 to 5500 feet north and 6000 feet south by Tuesday. Gusty south to southwest winds will continue through Tuesday. Thursday there will be some showers in the morning with decreasing clouds during the day. Partly to mostly sunny Friday and early Saturday and then another low pressure trough will move through late Saturday and Sunday (see map below). Interesting and wet weather pattern to develop over the next few days. 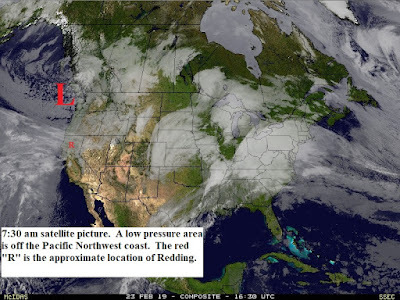 This morning there is a low pressure area off the Pacific Northwest coast. This low will move slowly southward and then move inland late Wednesday and Thursday. Light precipitation is expected later today and Sunday. Snow levels will be 2000 feet north and 3000 to 3500 feet south. However, in the north....Redding northward....cold trapped air will bring the snow level down to 500 to 1000 feet. 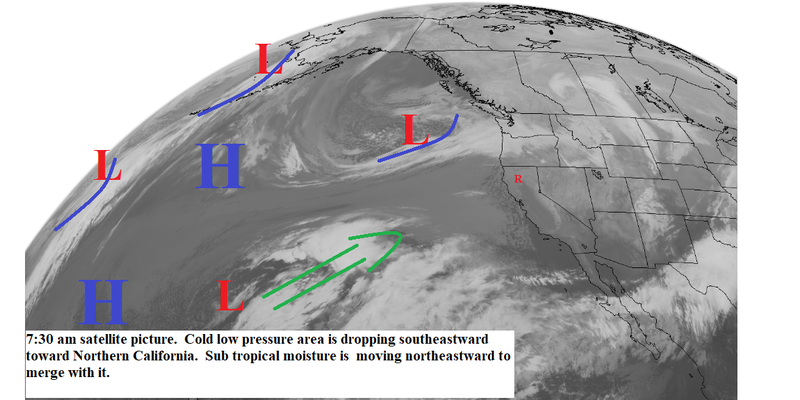 Monday through Thursday the low off the coast will be begin to merge with moisture streaming across the Pacific. Rain will increase over the area with locally heavy rain Tuesday and Wednesday. Snow levels will rise to around 4000 feet north and 5000 to 6000 feet south. Thursday the precipitation will turn to showers as the low pressure trough moves eastward. Three will be a short break Friday and then another low pressure trough will bring rain to the area for the weekend. 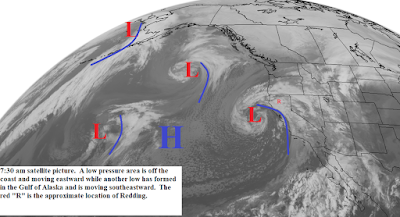 A cold low pressure area is dropping southward into Northern California. This system has limited moisture but will bring snow flurries to the foothills and mountains today and early Thursday with a chance of isolated showers in the valley. Skies will be clearing Thursday afternoon with clear skies and gusty north winds continuing through Friday. Saturday the next low pressure area will be dropping southward. However, this system will have a more offshore track (see map below). This will allow this low to pickup more moisture. Clouds increase Saturday with rain Saturday night and Sunday. Snow levels will be 2000 feet north and 3000 feet south. 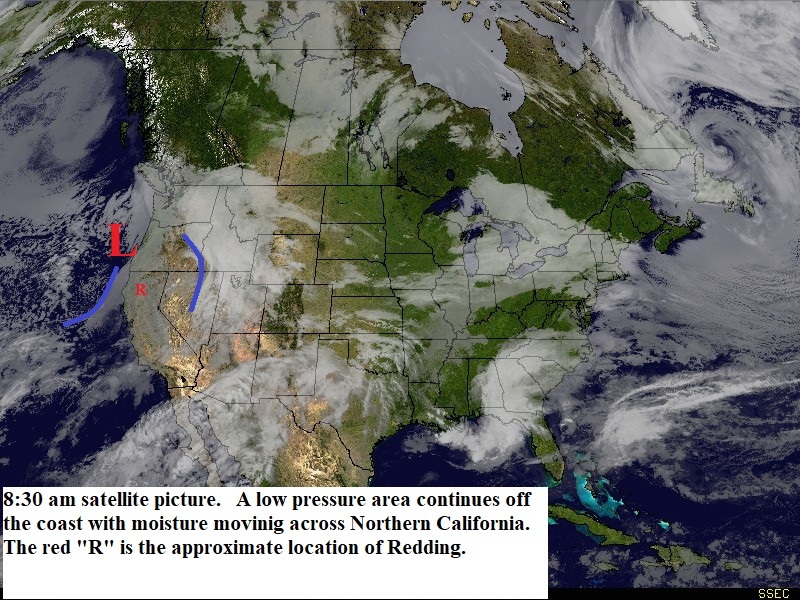 However, cold trapped air will drop the snow level to 500 to 1000 feet from Redding northward. A warmer storm system will move into the area Monday afternoon through Wednesday morning. Rain will be heavier with snow levels rising to 4000 to 5000 feet north and 6000 feet south. Cold weather pattern to continue over the west coast this week. 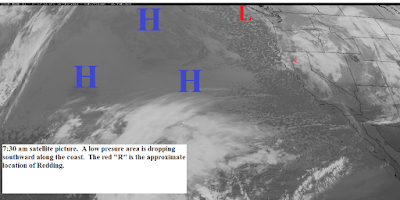 The high pressure ridge is along the coast with the jetstream dropping from Northern Alaska through western Canada and into California. Low pressure areas dropping southward don't spend much time over the water so their moisture is very limited when they reach our area. Today and Tuesday will be mostly sunny with clouds over the mountains. Temperatures will be below normal with locally gusty north winds. Wednesday afternoon and early Thursday another storm system will move through the area (see map below). This system will bring scattered snow showers to the foothills and mountains with a chance of an isolated rain shower in the valley. Sunny skies return Friday and then another relatively dry storm will move through late Saturday and Sunday. Sorry about the missed blog. Had intermittent power outages but no cable, phone, or internet for 4 days. We are now in a weather pattern where the high pressure ridge is just off the coast and extends northward into Northern Alaska (see map below). The jetstream comes over the top of the ridge and runs southward along the coast and then turns eastward over California. This pattern brings cold air into Northern California but the storms are close to the coast as they drop southward and therefore can't pickup much moisture. We will be in this pattern through Friday. Today and Sunday a low pressure area will move through with snow over the foothills and mountains and scattered showers in the valley. Snow levels will be around 1000 feet north and 2000 feet south. Monday and Tuesday look partly sunny and cool with gusty north winds. Another cold storm will move through Wednesday afternoon and Thursday. Once again most of the precipitation will be in the foothills and mountains with scattered showers in the valley. Snow levels will be 1000 to 150o feet north and 2000 feet south. Next weekend looks dry with slightly warmer temperatures. Well this is quite a complex weather pattern we will deal with over the next 4 days. 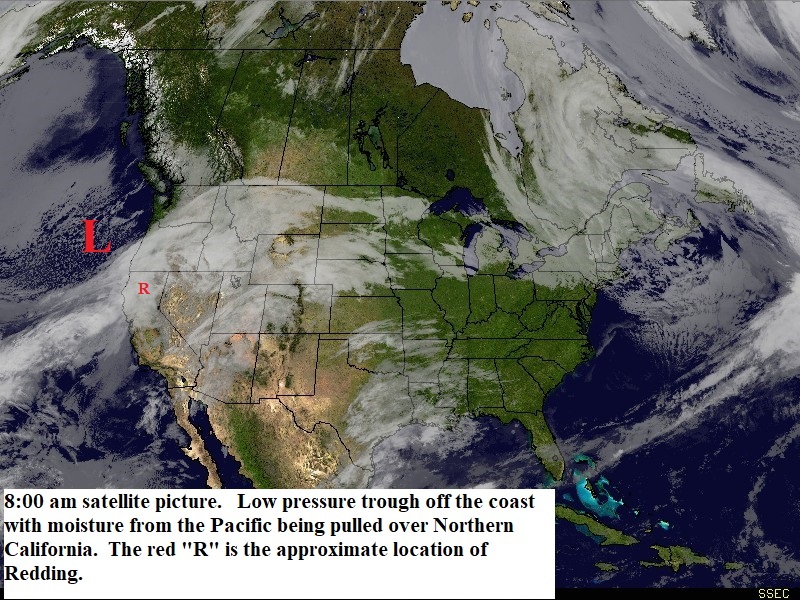 This morning''s satellite picture (below) shows another cold low pressure area dropping southeastward toward Northern California. It also shows a large area of sub tropical moisture north of Hawaii moving northeastward which is forecast to merge with the cold low over Northern and Central California. We also have quite a bit of cold air trapped in the valleys from Redding northward. Where these 2 air masses merge there will be a well defined boundary with heavy precipitation along it. Snow levels will be low north of this boundary and higher south. Today we will see partly cloudy to cloudy skies with a few light showers along the coast range and from Redding northward. Snow levels will be near 1000 feet due to trapped cold air. Tuesday afternoon and Wednesday the storm system will move over Northern California. Moderate to locally heavy precipitation will occur over the area. Snow levels from Redding northward will be 2000 to 2500 feet locally 500 to 1000 fee in the canyons from Redding northward. Snow levels south will be 3000 to 4000 feet. The rain will turn to showers late Thursday and end Thursday night.. Snow levels Wednesday night and Thursday will be around 4000 feet north 6000 feet to the south. A shift in this pattern as it develops could mean major changes. Late Friday another low pressure trough will be dropping along coast. This should keep the weekend showery with snow levels 3000 to 4000 feet (see map below). Today and and Thursday Northern California will be partly cloudy to partly sunny with continued cold night time temperatures. Friday the low pressure area shown in the Gulf of Alaska on this morning's satellite picture (below) will move through the north state. 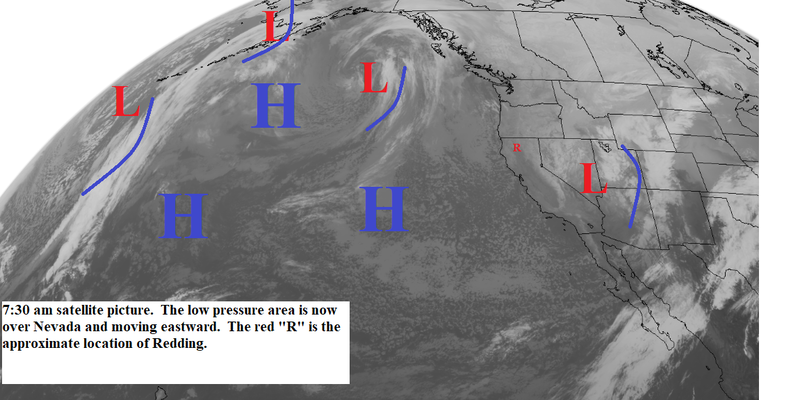 This will be followed Saturday and Sunday by another cold low pressure area (see map below). Snow levels with these systems will be 1000 to 1500 feet north and 2000 to 2500 feet south. Due to trapped cold air in the canyons the snow level will be locally 500 feet from Redding northward Friday and Saturday. The precipitation will turn to showers Sunday afternoon and end Monday during the day. Sunny over the valley with a few clouds in the mountains Tuesday and Wednesday and then another storm is possible Thursday and Friday.